Walking along Shakespeare Street in Nottingham and on the way to work at 8.15am, I noticed an unusual aroma in the air. Not the usual traffic or industrial smells that fill the air in most large conurbations but an unmistakable and undeniable smoky legacy of a major fire. Talking briefly to a colleague on the way to my assignment, she confirmed to me that there had been a serious fire in the vicinity of Goldsmith Street, adjacent the university’s main entrance. That minor inconvenience seemed inconsequential however when I realised that the Rescue Rooms venue had been evacuated of 1400 people on a ‘student night’ and that the famous ajacent venue, Rock City, could easily have gone up in flames. 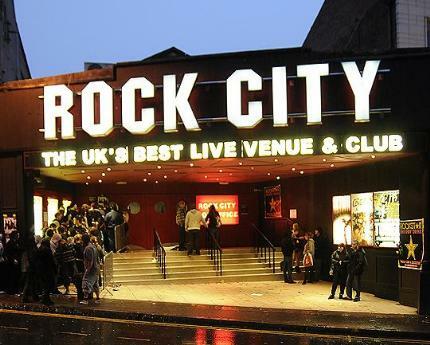 Nottingham’s Rock City is not a world-renowned auditorium, nor does it have a history that traces pre the 1980s, it is however extremely well regarded by knowledgeable UK music fans and gig-goers. It also has a back catalogue of live acts that is truly remarkable which includes the likes of U2 and REM. I had the good fortune and possibly foresight to attend the newly-opened Rock City back in it’s seminal days after being converted from a ‘chicken in a basket’ nightspot called The Heart of the Midlands as was popular up and down the country in the 1970s. In those days the city of Nottingham really suffered for a decent rock venue. It was largely after the days of many a famous act at the boat clubs at Trent Bridge and before the days of The Royal Concert Hall. Apart from the very odd gig in the old Albert Hall, practically the only opportunities to watch live bands were in city centre pubs such as The Hearty Good Fellow on Maid Marion Way and The Imperial Hotel’s ‘Cooler Bar’ on St. James Street. The latter of which I had many a memorable evening at. Many of the gigs I attended in those day entailed travelling to Leicester’s De Montfort Hall and Granby Hall where I saw many big name acts such as The Who and The Rolling Stones and some who were to achieve levels of greatness such as The Jam and Elvis Costello. There were so many nights, and everyone will have their own view and memories of them but perhaps the most astonishing night for me was on attending a Bad Manners gig. The ska men were ripping into a fantastic set with the audience apparently having a great time when suddenly all hell was let loose with a pitched fight in the crowd and a hail of glasses being thrown. The police were called that night and the gig discontinued. Many big bands point back to early Rock City gigs as some of their most enjoyable. Nobody will ever point to the venue as being salubrious or well appointed, but what was never in doubt was the extraordinary atmosphere generated in the Nottingham venue. Long may that continue. Rock City had an unfortunate rumoured association with fascist groups in its early days. Never did find out how true that was but there were stories of Skrewdriver and the like playing there. My own early experiences of the place were seeing Hawkwind the last time they were properly good. Before I lived here too. Seem to remember we took in the Trip for a pre gig snifter, that was a first for me too. Some of your references really took me back to memories of nights on Trentside, the Hearty and especially The Imperial. Every Thursday night for ages I turned up to drink underage and see a band called Gaffa. I still miss them! I played with GAFFA in the Late seventies and you may be interested to know that together with Wayne Evans & John Maslen we are due to play at the Contemporary Gallery in Nottingham on March 5th 2011. Playing a selection of old GAFFA songs. Hi Clive and thanks very much for dropping by. That’s great news about the gig, I will definitely make a point of coming along for that one and will look forward to hearing those songs again! Enjoyed you and the lads playing at The Imperial on so many great Thursday nights. I have many pleasant memories. Good luck in whatever you are doing now. I hope you are still playing and enjoying it.